Earlier this week, Google dropped the bomb that we were expecting, but hoped wouldn’t come: Google will no longer pass search query strings in the referrer URL string. What this means is that the “search query” reports in Google Analytics and other packages will no longer contain data from Google. First, let’s quell the still-persistent rumor that Adwords search query reports are going away. That’s false. Google has stated that SQRs will remain intact. Using search query reports for PPC keyword research is still an option. Some are saying that the “not provided” announcement is no big deal because we can still get data from SQRs, or from the Google API. Even George Michie of RKG, normally a skeptic, isn’t too worried about not provided. Others, though, are more upset. Brad Geddes of Certified Knowledge is rightfully concerned with the dwindling amount of transparency coming from Google. He goes so far as to say that “all new hires should start working in Bing before AdWords so that they can learn how different users react per device so new marketers can be trained properly about setting up and managing campaigns and site flows by device.” That’s a pretty bold statement. Bryant Garvin shares Brad’s concern, and surfaces another problem: advertisers with long sales cycles, or those who are using the search query in dynamic landing pages, are now out of luck. They won’t get as clear a picture into what queries are ultimately driving sales, and they’ll be forced to use keywords, rather than search queries, on dynamic landing pages. Anyone who’s done PPC for a while knows that search queries and keywords are often very different. We knew this was coming eventually. As soon as Google took away search query data from SEO, we knew it was only a matter of time before they made the same move for PPC. At the time, some were unconcerned, saying we were relying too much on search queries to begin with. And yet others lamented the fact that keyword research had already taken a hit with the new Keyword Planner – “not provided” was yet another blow to good search marketing. The fact remains that we’re stuck with this whether we like it or not, just like we’re stuck bidding on tablets and lacking separate bids for search partners. For better or for worse, Google is the market leader and can do whatever they want. But I’m dismayed at this recent turn of events. While I’m glad we’ll still have our search query reports, and I understand that there are privacy (and therefore, legal) issues at stake, I am not excited about the trend toward less, rather than more, transparency. Bing, on the other hand, just keeps chipping away at the Google behemoth. They still allow mobile-only and tablet-only campaigns. They pass search query data in the referrer. They have visitors who never use Google and can’t be reached by Adwords. And they cost less – a lot less in many cases. Is it time to give Bing Ads more of our money? I’m thinking yes. For a nice roundup of articles about not-provided in PPC, check out Bryant Garvin’s blog or this post by Luke Alley over at Avalaunch Media. 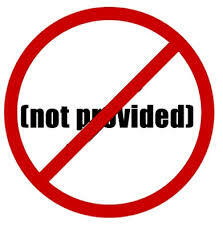 What’s your take on “not provided”? Is your life ruined by it, or will it be business as usual for you? Are you thinking about moving money to Bing? Share in the comments! Great post Mel! Really nice to see a roundup of most of the commentary so far all in one place. It’s interesting to see how much still needs to be clarified. In Adwords, I import Analytics goals to provide my conversion data, so I wonder what the impact will be on conversion data for my SQRs there? I really don’t want to have to install the Adwords pixel if I can get away with it, but I guess there may not be a choice. I expect we’ll find out more in the coming weeks – I think this was going to be the “big” announcement on the 22nd, but that we’ve jumped the gun somewhat with all of our speculation. If you have never done deep analysis on 50,000+ organic keywords to help determine 2nd tier themed segments that can be applied to multiple keyword groups to find new and just under the surface variations that can increase targeted traffic and high converting variations, then you (anyone) will probably not fully understand the loss that has resulted from (not provided). Agree wholeheartedly, James. This hurts the larger / more sophisticated advertisers most. I still don’t understand why Google wants to alienate their biggest spenders. Exactly. We’re all calling it the Adwords (not provided) Announcement, but in reality it’s nothing like that. Much less of an impact to us as (not provided) was to SEOs. Hi Melissa. Yes, it’s a hassle, but not insurmountable. Easiest way to get around this is start using exact match keywords. You can start with broad or phrase, but over time, as you run SQR, replace them with exact and pause or delete the non-exact. Yes, it’s more hard work, but it does the trick. If you want to get even more granular, use a tool like Improvely to track every single keyword, ad, ad group, campaign and ad message. Even more work but more visibility again. I didn’t read it like that. Google Analytics can/could still get the search queries, for auto-tagged accounts, via gclid, even if they’ll strip them from the referrer URLs. I sure hope the “Matched Search Queries” dimension in Google Analytics will still be available. For other Analytics packages it’ll be tough, but GA can find a way around this restriction due to its close integration with Google AdWords. Hi Calin- what I heard is that auto-tagged accounts will NOT have search queries available in GA, but that manually-tagged URLs would show up. Also that data would be available via Value Track. But I really don’t know for sure – hopefully one of my readers will chime in on this one! Unfortunately and concidentally :), ValueTrack does not include search terms among the parameters, as we all know … Well, I can still hope to keep seeing the Matched Search Query, right? I’m definitely using it, especially when budgets are tight and I don’t want to wait for the data to show up in AdWords to be able to add negatives. This leads as far as the keyword, plus some other interesting stuff like user location, but it doesn’t contain the query. The only places to see queries are Google AdWords (SQR, Paid vs Organic) and Google Webmaster Tools. Color me very unhappy, Martin, if this will be the case.